Every kitchen installation – big or small – comes with its own set of challenges. After all, problem solving is what design is all about, at its core. For this Chicago kitchen remodel, I was approached by Michael Miller, Director of Centaur Interiors. His client – a bachelor – wanted a breathtaking kitchen that would function well for a single user while also accommodating frequent large scale entertaining. The client’s downtown Chicago penthouse offered vast and impressive views of the lake and the city which we wanted to highlight as much as possible. Unfortunately, the interior lacked the same allure and was constructed in such a way that prevented the full enjoyment of such views. There was a very large wall separating the living room from the kitchen, which resulted in an awkward layout with cramped spaces. By removing the wall, the space was immediately transformed. The new open plan layout allowed both the kitchen and the living space to soak in the lake-to-city views, creating that “wow” factor that the client wanted. 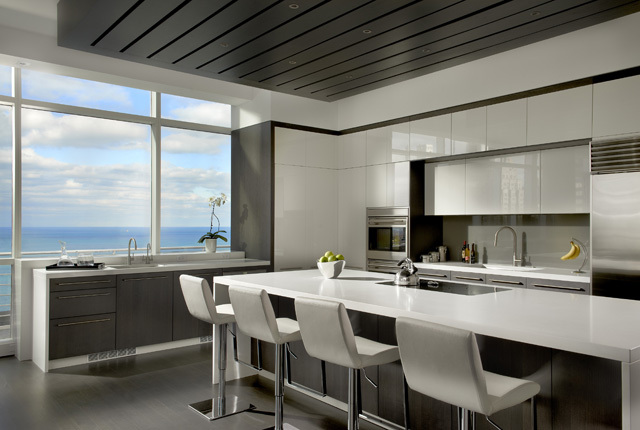 For the cabinets, we chose a luxurious white high gloss lacquer that would mirror the skyline and bring the outside in, allowing the view to be the star of the space. We also added some Dark Ash wood cabinetry to create visual drama without overwhelming. The modest lines of Snaidero’s CODE cabinet style helped in this respect because they blend in naturally with the quiet elegance of the streamlined interior architecture. While turning to an open plan layout solved one problem, the impressive size of the new space presented a new set of challenges. The area designated for the kitchen had to be scaled to feel intimate enough for a single person to use, while providing enough room for caterers and a large number of guests during parties. This was made even more difficult by the presence of a very large architectural support column located exactly at the center of what should have been the main workspace of the kitchen. The only way around this was to turn this obstacle into a design advantage by creating four different work zones within the kitchen and using the column as a divider between two zones. This approach gave the client a multi-purpose kitchen, one that could perform well for a large team of caterers, yet function just as smoothly for a single person preparing a simple meal. Today’s appliances provide state-of-the-art functionality and that is always the #1 priority. However, with most kitchens now sharing an open space with the living area, aesthetic factors must also be taken into account. You want the appliances to be well integrated into the design so as not to be too distracting. In this Chicago kitchen remodel, since the client was going to need large appliances, I designed the height and width of the cabinetry to balance the size and placement of the equipment so the scale between all materials would be harmonious. The induction cooktop gives the client the efficiency of gas cooking while maintaining a sleek aesthetic. The flush inset installation allows for a continuous plane on the island, so if the cooktop isn’t needed, it can be locked and function as part of the counter surface (especially useful during catered parties). Finally, Centaur Interiors designed and built the decorative wood housing to conceal the hood motor above the island. This provided both additional lighting and an opening to have an unobstructed view of the windows.